Axes can be selected to move with the plate as shown in Fig. 7.7(a) or stay at the initial, undeflected position Fig. 7.7(b). Fig. 7.7(a). Origin of reference axes taken to move with the plate. Fig. 7.7(b). Origin of reference axes remaining in the undeflected plate position. (i) Slope 6 and deflection y non-infinite at the centre. .'. 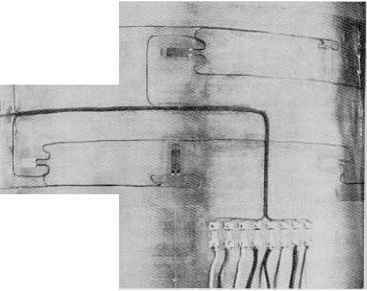 C2 — 0. (i) Slope 0 and deflection y non-infinite at the centre. :.C2 = 0. Again the maximum deflection is that given at x = R.
It is now convenient to consider the stress distribution in plates subjected to lateral, uniformly distributed loads or pressures in more detail since this represents the loading condition encountered most often in practice. Figures 7.8(a) and 7.8(b) show the radial and tangential stress distributions on the lower surface of a thin plate subjected to uniform pressure as given by the equations obtained in §§7.5 and 7.6. Fig. 7.8(a). 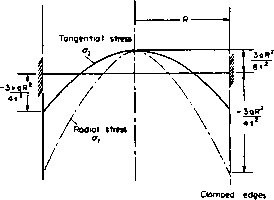 Radial and tangential stress distributions in circular plates with clamped edges. Fig. 7.9. 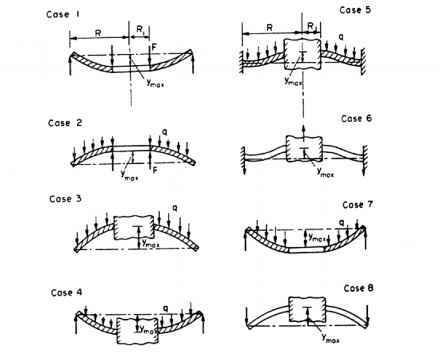 Comparison of bending stresses in circular plates for clamped and freely supported edge conditions. The two figures may be combined on to common axes as in Fig. 7.9 to facilitate comparison of the stress distributions for freely supported and clamped-edge conditions. 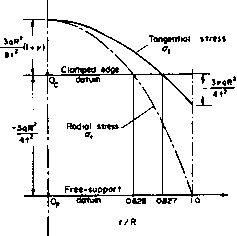 Then if ordinates are measured from the horizontal axis through origin Oc, the curves give the values of radial and tangential stress for clamped-edge conditions. Alternatively, measuring the ordinates from the horizontal axis passing through origin Of in Fig. 7.9, i.e. adding to the clamped-edges stresses the constant value |qR2/t2, we obtain the stresses for a simply supported edge condition. The combined diagram clearly illustrates that a more favourable stress distribution is obtained when the edges of a plate are clamped. (1) The maximum deflection of a uniformly loaded circular plate with freely supported edges is approximately four times that for the clamped-edge condition. (2) Similarly, for a central concentrated load, the maximum deflection in the freely supported edge condition is 2.5 times that for clamped edges. (3) With clamped edges the maximum deflection for a central concentrated load is four times that for the equivalent u.d.l. (i.e. F = q x ttR1) and the maximum stresses are doubled. (4) With freely supported edges, the maximum deflection for a central concentrated load is 2.5 times that for the equivalent u.d.l. ^ S. Timoshenko, Strength of Materials, Part II, Advanced Theory and Problems, Van Nostrand. The values of the factors k\ and k2 for the loading cases of Fig. 7.10 are given in Table 7.2, assuming a Poisson's ratio v of 0.3. Table 7.2. Coefficients k\ and k2 for the eight cases shown in Fig. 7.10(").